Amman is Jordan’s capital city which is renowned for its ancient cultures, historical architectural monuments and spectacular Roman ruins. This dynamic city is an ideal destination that caters for all travellers; it makes for a romantic getaway for couples, fun-filled trip for families and sightseeing getaway with friends. The options are plenty here; climb mountains in Wadi Rum, go horseback riding in Jalaad, take a hot air balloon ride to discover amazing landscapes, stroll around the Al Bukharia souk to explore a range of products including jewellery, authentic souvenirs, lanterns, and antiques, and head to the excellent Kan Zaman restaurant to bite into traditional Levantine and Jordanian cuisines. You can also go scuba diving, windsurfing, fishing, snorkelling, sailing, and water skiing in Aqaba. Amman is home to plenty of architectural wonders which make for great sightseeing opportunities; visit the blue-domed King Abdullah Mosque that features four towering minarets and Ottoman architecture. 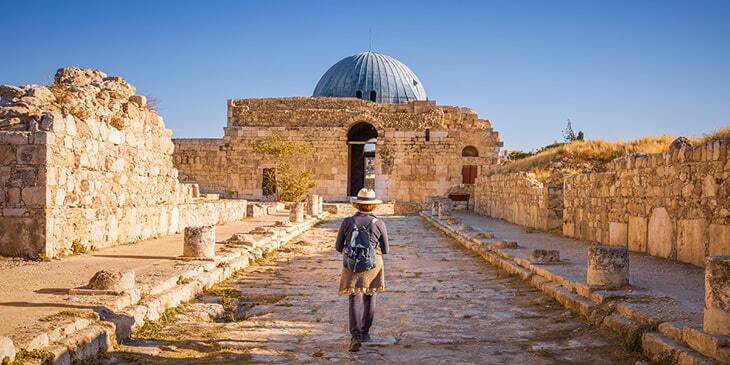 Head to the Roman Citadel to discover ancient Byzantine, Roman, and Umayyad ruins dating back to the Neolithic period. You can also visit the 2nd century Roman Amphitheatre, built during the reign of Antoninus Pius and Mosque Abu Darwish and constructed with traditional Levantine architecture. Other must-visit monuments of the city include Amman’s oldest building, Duke’s Diwan and the Al-Husseini Mosque, constructed by King Abdullah with Ottoman style architecture. Brightsun Travel offers a range of cheap tickets to Amman, so get planning for your next exotic getaway now! You’ll discover many captivating museums and groundbreaking art galleries in Amman. Visit the Royal Automobile Museum to discover a range of American cruisers once used by Hollywood stars, as well as more than 70 vintage cars and motorbikes used by King Hussein. Afterwards, head to the Jordan Museum that features a rare collection of human sculptures, including a 9500-year-old statue recovered from the archaeological site of Ain Ghazal, as well as over 2,000 artifacts. The Jordan National Gallery of Fine Arts is another fine venue displaying a variety of pottery, paintings, sculptures, and contemporary artworks created by Jordanian and other Middle East artists. Brightsun Travel offers direct flights to Amman, taking you to the heart of this paradise for culture vultures.